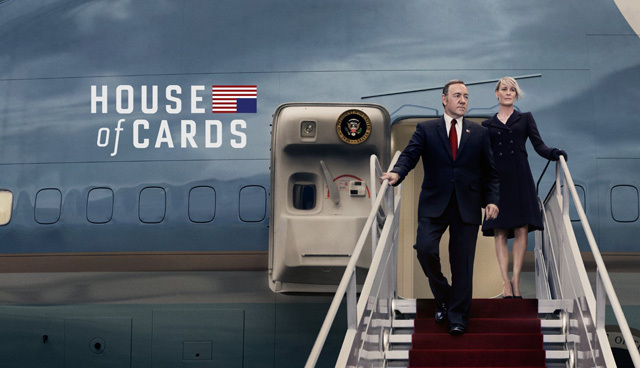 HOUSE OF CARDS: What Next For The Underwoods? | Warped Factor - Words in the Key of Geek. 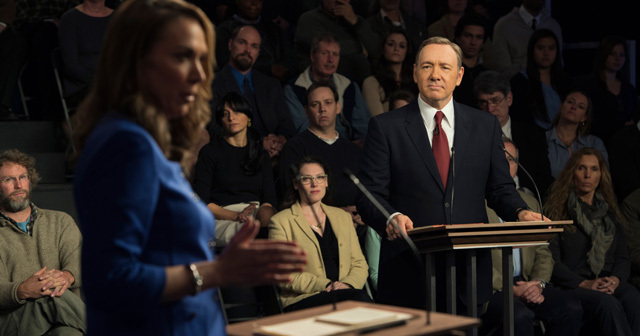 HOUSE OF CARDS: What Next For The Underwoods? Nicholas Brent asks, what's next for the Underwoods? In my eyes, House of Cards really isn’t the sort of show that should be binged watched but even I could not follow that rule! It’s too darn good. I found myself starting and finishing the first three seasons within my free trial of Netflix and have since been longing for more. In this article I am going to briefly explore where I would like House of Cards to take us in the future, and naturally there will be some brief but significant spoilers for the first three seasons. The first two seasons saw Frank Underwood (Kevin Spacey) rise up through the ranks of power as he worked his way into the position of Vice President and then slimed his way up higher, into the Oval Office. Season three saw a slightly different approach; with Frank finally at the top he had to retain his power as he fought in the presidential election and tried to keep control of his party. His wife Claire (Robin Wright), whom he had schemed with all along, believed she got no benefits from their increased status, causing her to think they no longer stood as equal partners, leading her to leave him at the end of the series. This will no doubt have a large effect and almost certainly a negative one on Frank’s bid for the election. Now I’m not someone who likes too much redemption for characters, but I do hope the pair sort it out quickly and get back together because they are probably one of my favourite on screen couples. On top of this, I really want to see Frank win the election and get the chance to be President in his own right, something I can’t see happening if Claire actually leaves. Perhaps for the first half of the fourth season it would be interesting to see Claire leave him, putting his election bid in peril. Then the series could possibly focus on Frank trying to get Claire back as he battles against Heather Dunbar in the fight for the democratic nomination. Eventually they should get back together and, like in the first two seasons, fight alongside each other for the presidency. Any viewer knows that Frank is no amateur when it comes to murder, and I think a very interesting plot twist would be Frank murdering Dunbar in his attempts to be reelected, or perhaps he might task his Chief of Staff, Doug with such a job. Either way I think Frank will definitely win the nomination for the Democrats. Putting to bed the ‘card deck’ rumours (suggesting that there’ll only be four seasons of 52 episodes, like that of a deck of cards), a Reddit user has revealed that the show is signed on for at least two more seasons; five in total. From this, I am hoping that season four will focus on Frank and Claire’s relationship and his securing of the presidency and then in season five it would be great to see Franks final downfall, but more on that later. Backtracking slightly, what if season four doesn’t see Frank and Claire get back together? What then? As I have mentioned previously, it will no doubt have a disastrous effect on Frank’s bid, but what will she do without him? Perhaps she could turn her support to Dunbar or even run for office against Frank, to throw a spanner in the works she could run for the Republicans. Either one would make an incredible series, but my hopes still lie with the idea they will get back together and Frank will be president once again. Despite my hopes that season four will see Frank become president in his own right, the apparent confirmation that there will be a fifth season has got me thinking about the possibility of Frank’s downfall. But what would it be? Impeachment? He’s certainly done enough to warrant one! Or perhaps an assassination, I’m sure Frank has enough enemies to warrant one of those too. Coming back to the idea of Claire and Frank’s separation, perhaps she kills him… I’m not too sure how well that would go down but I for one think it would be an amazing ending to an amazing series. Oh, and talking of Impeachment, I would like, no, I want a Bill Clinton cameo at some point! I’m sure anyone would agree that such a thing would be amazing!